1. Kaewkhao, J., Chewpraditkul, W., 2006, “Effective Atomic Numbers of Cu/Zn Alloy Using Transmission Experiment”, KMITL Science Journal Vol.6 No.1. pp. 30-35. 2. Kaewkhao J., Laopaiboon J., Laopaiboon R., Pencharee S. and Chewpraditkul W., 2006,”Synthesis and Characterization of Bismuth Silicate (Bi4Si3O12) Polycrystals” Laos Journal of Applied Science Vol.1 No.1, pp. 88-91. 3. Kaewkhao J., Laopaiboon J., Laopaiboon R. and Chewpraditkul W., 2006, “Determination of Effective Atomic Numbers and Related Parameters for Cu/Zn Alloy” Laos Journal of Applied Science Vol.1 No.1 , pp.92-97. 4. Kaewkhao, J., Comtamul, T. and Chewpraditkul, W., 2008, “Effect of Copper (ll) Oxide to Glass Properties from Local Sand in Nakorn Pathom Province” , Thai Journal of Physics, Vol.3, pp.152-153. 5. Kaewkhao, J., Pokaipisat, A. and Limsuwan P., 2009, “Study on Optical and Physical Properties of Glass from Local Sand Doped with CeO2”, Thai Journal of Physics, Vol.4, pp.61-63. 6. Srisittipokakun, N., Keadkaew, C., Kaewkhao, J., Kittiachawal, T., Thamaphat, K. and Limsuwan, P., 2010 “Electron Spin Resonance (ESR) and Optical Absorption Spectra of a Manganese Doped Soda-Lime-Silicate Glass System” Kasetsart Journal Vol. 43(5), pp.360-365. 7. Kaewkhao, J. and Limsuwan, P., 2010 “Development of Color Glass as Imitation Gemstone for Ornament Industry” Journal of Research and Innovation for Thai Industries Vol.1 (1) pp. 53-59. 8. Limkitjaroenporn, P., Kaewkhao. J. and Chewpraditkul, W., 2010, “The Mass Attenuation Coefficients of PbO-Na2O-B2O3 Glasses System at Gamma-Rays Energy 662 keV”, Thai Journal of Physics, Vol.5, pp.290-292. 9. Boonin,K., Kaewkhao, J., Ratana, T. and Limsuwan, P., 2010, “Effect of Er3+ to Physical and Optical Properties of Bi2O3-B2O3 Glass System”, Thai Journal of Physics, Vol.6, pp.241-243. 10. Srisittipokakul ,N., Kaewkhao, J., Kedkaew, C. and Limsuwan, P., 2010, “Effect of Manganese Doped in Soda Lime Silicate and Soda lime Borate Glass System: A Comparative Study”, Thai Journal of Physics, Vol.6, pp.244-246. 11. Ruangtaweep, Y, Kiitiauchawal T., Kaewkhao, J., Mungchanankit, A., Thamaphat, K, and Limsuwan, P., 2010, “Study of ESR Spectra for Fe3+ Ions in Soda Lime Silica Glass”, Thai Journal of Physics, Vol.6, pp.250-252. 12. Kaewkhao, J., Tuschareon, S., Kirdsiri, K. and Limsuwan, P., 2010, “Investigation on Physical and Optical Properties of PbO-CaO-P2O5 Glass”, Thai Journal of Physics, Vol.6, pp.358-359. 13. Kirdsiri, K., Kaewkhao, J. and Limsuwan,P., 2011, “Fabrication and Optical Investigation of Lead Borate Glasses”,Journal of Srinakharinwirot University, Vol.3(1), pp. 77 -83. 14. Srisittipokakun, N., Kaewkhao, J. Kirdsiri, K.. and Limsuwan,P., 2011, “Fabrication and Properties of Soda Lime Borate Glass Doped with MnO2”,Journal of Srinakharinwirot University, Vol.3(1), pp. 148 -155. 15. Limkitjaroenporn, P., Kaewkhao J., Limsuwan, P. and Chewpraditkul, W., 2012, “The Mass Attenuation Coefficients of Zircon Blue by using Compton Scattering Technique”, Thai Journal of Physics, Vol.8 pp.79-81. 16. Nuwan, L., Srisittipokakum, N., Kirdsiri, K., Chimalawong, P. and Kaewkhao, J., 2013, “Effect of Gd2O3 Doping on the Physical and Optical Properties of Soda Lime Silicate Glass”, Thai Journal of Western Rajabhat Universities, (Special Issue) 1, pp.67-73. 17. Angnanon, A., Srisittipokakum, N. and Kaewkhao, J., 2014, “Study of the recycling plaster mold from jewelry industry”, Thai Journal of Western Rajabhat Universities, Vol 8 (2), pp.45-51. 18. Kaewjang, S., Maghanemi, U., Kothan, S., Limkitjaroenporn, P. and Kaewkhao, J., 2014, “Comparison Study on Gadolinium-Calclium-Silicoborate Scintillation glass doped Neodymium and Erbium”, Thai Journal of Western Rajabhat Universities, Thai Journal of Western Rajabhat Universities, Vol 8 (2), pp.61-67. 19. Boonin, K., Sa-ardsin, W. and Kaewkhao, J., 2016, “The luminescence characteristics of Eu3+-doped lithium-gadolinium borate glasse”, SNRU Journal of Science and Technology 8(1), pp. 122-126. 20. Boonin, K., Sa-ardsin, W. and Kaewkhao, J., 2016 “Reuse of plaster waste from jewelry industry by mixing with new plaster”, Journal of Materials Science and Applied Energy 5(1), pp. 30-33. 21. Chanthima, N., Preechayan, T., Insiripong, S. and Kaewkhao, J., 2016 “Theoritical study on the basis of photon interaction parameter or dental amalgam”, Journal of Materials Science and Applied Energy 5(1), pp. 38-42. 22. Kirdsiri, K., Damdee, B. and Kaewkhao, J., 2016, “Photoluminescence and optical properties study of Dy3+ doped lithium calcium borate glasses”, Suranaree Journal of Science and Technology, 23(1), pp. 53-58. 23. Yasaka, P., Boonin, K. and Kaewkhao, J., 2016, “Structural and photoluminescence properties study of Dy3+ ion in zice bismuth borate glasses”, Suranaree Journal of Science and Technology, 23(1), pp. 69-75. 24. Ruamnikhom, R., Yasaka, P. and Kaewkhao, J., 2017 “Luminescence analysis of samarium (III) ions doped in Bi2O3-BaO-B3O3 glasses”, Journal of Materials Science and Applied Energy 6(1), pp. 97-101. 25. Kaewnuam, E., Saikaew, S., Wantana, N. and Kaewkhao J., 2017, “Photoluminescence study of Eu3+ doped lithium lanthanum borate phosphor”, Journal of Materials Science and Applied Energy 6(1), pp. 106-110. 26. Wongdeeying, C., Yasaka, P., Mangthong, P., Sangwaranatee, N. and Kaewkhao J. , “Investigatio on spectroscopic properties of Dy3+ ion doped in zinc barium borate glasses”, Journal of Materials Science and Applied Energy 6(1), pp. 119-122. 27. Kaewnuam, E., Wantana, N. and Kaewkhao J., 2017, “Pr3+ doped lithium lanthanum borate glass for white emitting photonic s application”, Journal of Materials Science and Applied Energy 6(1), pp. 123-127. 28. Chanthima, N., Sangwaranatee, N., Preechayan, T., Chaiphaksa, W., Limkitjaroenporn, P. and Kaewkhao, J., 2017 “Theoritical calculation of gamma-ray interaction with dental materials”, Journal of Materials Science and Applied Energy 6(1), pp. 137-141. 29. Kaewjaeng, S., Kothan S, Kim, H.J., Kaewkhao, J., 2018 “Luminescence characteristics of gadolinium-calcium-silicoborate glass scintillators”, Journal of Associated Medical Sciences, 51 (1), 26-31. 30. Ruannikhom, R., Yasaka, P., Kaewkhao, J., “Physical and optical properties of Dy3+ bismuth barium borate glasses”, Journal of Thai Interdisciplinary Research, 12 (5), pp. 1 – 4. 31. 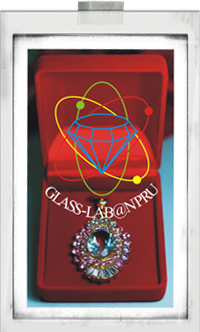 Ruangtaweep, Y., Kaewkhao, J., Hansupho, S., Huaikrachao, W., “Physical and optical properties of Ni2+ ions in borate glass”, Journal of Thai Interdisciplinary Research, 12 (5), pp. 19 –22. 32. Yasaka, P., Mangthong, P., Ruengsri, S., Kaewkhao, J., “Physical, optical and luminescence properties of zinc aluminium barium borate glasses doped with chromium oxide”, Journal of Thai Interdisciplinary Research, 12 (5), pp. 23- 29. 33. Srisittipokakun, N., Angnanon, A., Kaewkhao, J., “Effect of mixed NiO-CuO in soda lime silicate glasses”, Journal of Thai Interdisciplinary Research, 12 (5), pp. 29 – 34.